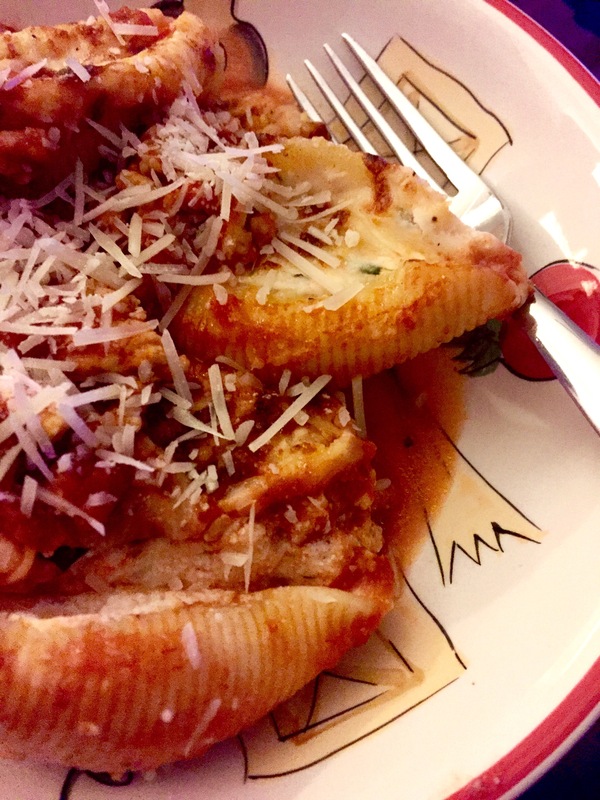 When I was kid, my mom used to make stuffed shells at least once a month. 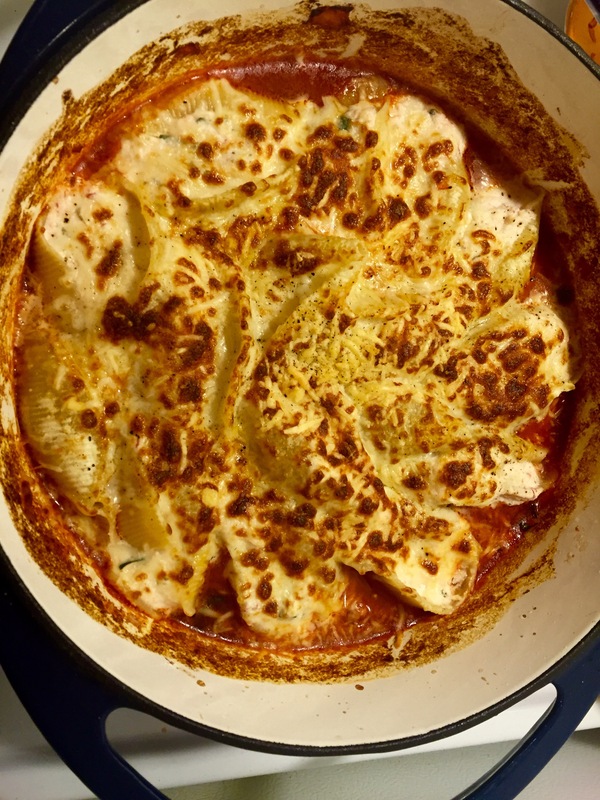 It’s when I first fell in love with ricotta cheese (which I can now eat straight out of the container) and was my first taste of Italian cuisine. I found this recipe the other day in a magazine and knew I had to try it. It’s almost like my mom’s recipe, but with subtle changes: roasted red peppers added, sauce on the bottom of the shells, and only broiling in the oven instead of baking. It’s pretty quick and easy to slap together for a weeknight meal, too. 1. Bring a large pot of salted water to a boil. Add jumbo shells and cook as package directs. Drain, reserving 1 cup of pasta water. 2. Meanwhile, in large Dutch oven, heat olive oil over medium high heat. Sauté garlic and shallots for 2 minutes, add ground turkey & salt and pepper. Sauté until browned, about 6 minutes. 3. Add crushed tomatoes, tomato paste, brown sugar, basil and reserved pasta water and simmer while stuffing the shells. 4. Stuff the shells: in small bowl, combine ricotta, egg white, oregano, parsley, red pepper, pinch of salt & pepper, and 2 TBS. Italian cheese. Stuff cheese mixture into shells and lay on top of sauce. 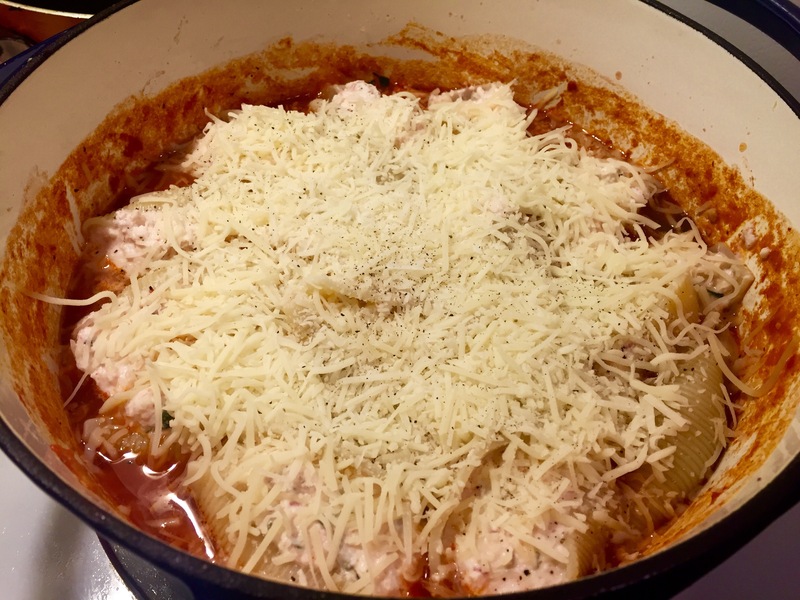 Sprinkle remaining 1/2 cup of Italian cheese blend on top of the shells & Parmesan, plus a few grinds of pepper. 5. Set oven to broil. Broil stuffed shells for 5 minutes or until browned and bubbly. Skill Level: Really easy. This recipe is very simple & requires little skill. The worst thing you could do is to overcook the pasta. Make sure to boil until al sentence (hard but edible). 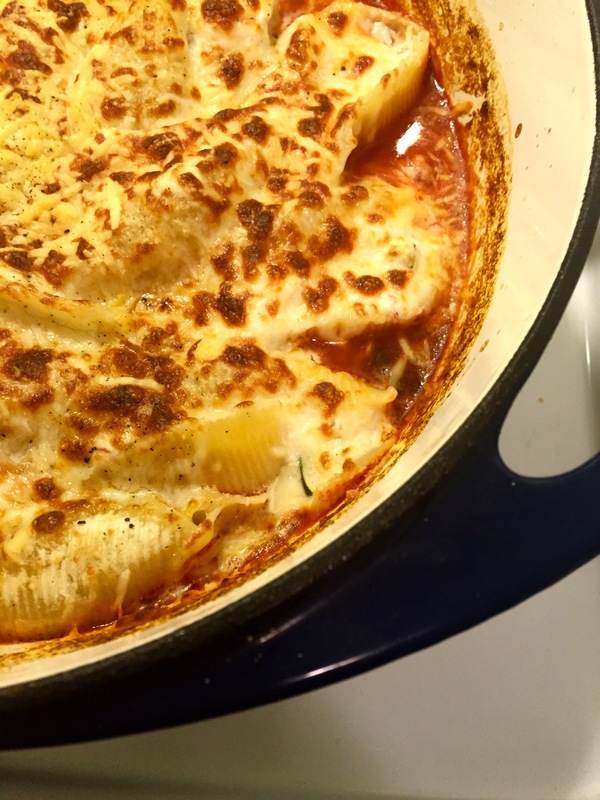 If over cooked the pasta will just fall apart when you stuff it & then cheese will just seep out. Don’t do that. Flavor Profile: The original recipe called for neither brown sugar nor basil, so without that your Bolognese would’ve been pretty bland. Brown sugar brings a slight sweetness to your tomato sauce, and I highly recommend adding some to any spaghetti sauces or marinara. And basil is just fantastic no matter what. You can use ground beef in place of the ground turkey. 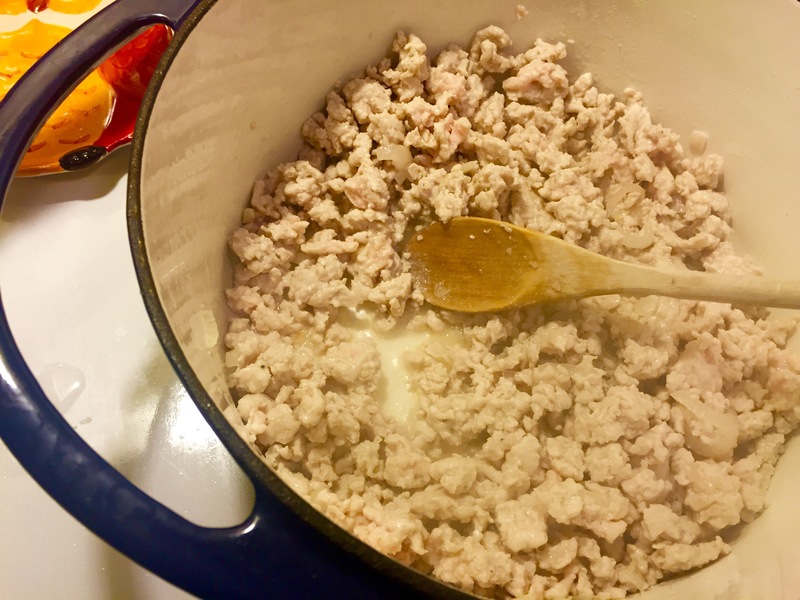 Ground turkey is extremely tasteless, so go heavy on the salt and pepper when you season it while cooking. If you use ground beef you won’t have to season it as much since the beef fat adds flavor. Versatility: There’s so many different things you can do with this recipe. 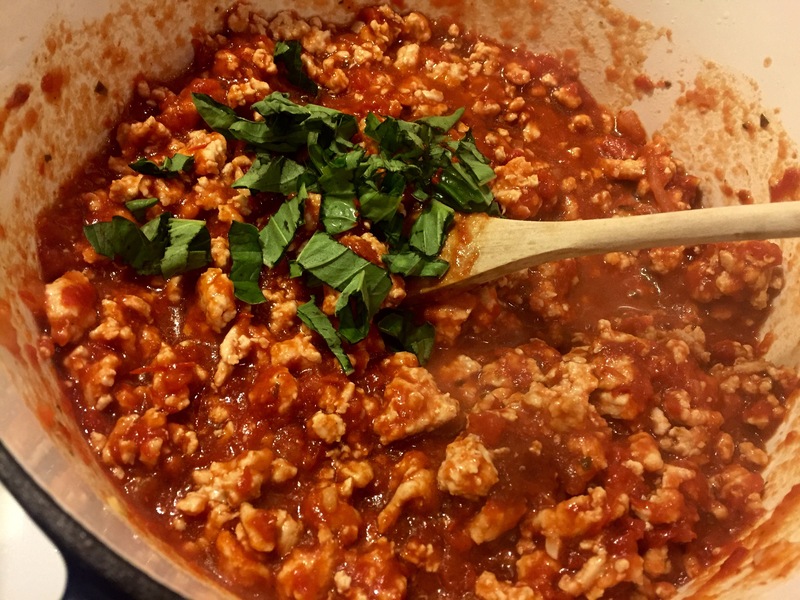 You can easily take out the ground turkey and make it a vegan dish, or you can add different herbs & veggies like mushrooms & flat leaf parsley. Mix it up! Make the Bolognese to your liking. End Score: A+. I would definitely make this again! A tasty meal everyone will enjoy.